Read Play Smart Archives of Older Product Reviews by TDmonthly. Watch Play Smart Archives of Older Product Videos by TDmonthly. Play Smart has a line of all new unique, brightly colored educational toys designed to give children endless hours of creative fun. 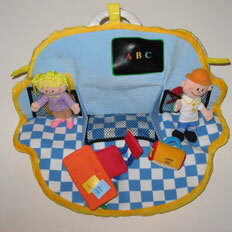 All toys are made of high quality wood and plush materials, made to pass our high quality standards. All Play Smart Toys meet or exceed EN71 and ASTM F963-96A toy testing standards. A perfect hands-on learning tool. 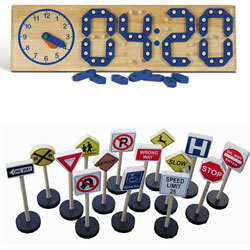 Children will learn to tell both digital and analog time by simply moving the clock hands and clock pieces. Free standing. Made of high quality wood. Non-toxic paint. 18 1/2 x 5 5/8 x 1 1/4"
Children will have lots of fun while learning important skills such as coordination, color matching and math skills! Tossing the sturdy twine rings onto their matching pegs makes this a real favorite among children. 11 ¼” hardwood base, 4 ½” colored pegs, Non-toxic paint. 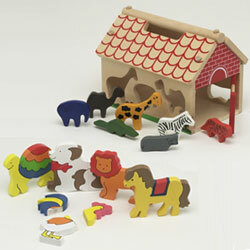 Mix ‘n match 15 brightly colored chunky wooden pieces to make animals or invent your own wacky creatures! Strong built-in magnets are easy to connect and stay securely in place. 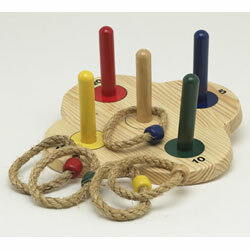 Great for building fine motor skills and eye/hand coordination. Set of 5 animals. Non-toxic paint. These pillows open up to themed plush playsets with characters and backgrounds for endless hours of pretend play and imagination.Comes in Firestation, Police, and School bus.